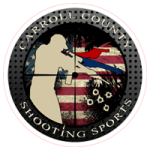 Carroll County Shooting Sports is a group of high school athletes and adults from Carroll, Iowa (and surrounding counties) . Our primary focus is firearm safety, and improving skills on the range. More info can be found on Carroll County Shooting Sports Facebook page. We plan to have meets the 2nd Sunday of the month, if weather permits (Mother’s Day Excluded) starting in April.